Having recently received a Client Distinction Award and being accredited by the Better Business Bureau (BBB) with their highest rating of an A+, I know the importance of quality representation. 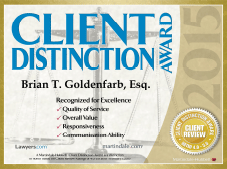 At the Law Office of Brian T. Goldenfarb, I routinely representation clients in various counties, such as, Middlesex, Monmouth, Mercer and Somerset. I regularly appear in both the Superior Courts and the many Municipal Courts in each of these counties. Whether is it a DWI/DUI, Criminal matter, Personal Injury case, Family Law issue or matter involving the new car Lemon Law, I will personally handle each matter myself from start to finish. Having an experienced, knowledgeable and aggressive attorney “fighting” for you, is only to your benefit. Have you been charged with drunk driving, a DWI, or a DUI in the State of New Jersey? Regardless of how you refer to drunk driving or a DWI, being arrested for a drunk driving offense can have significant consequences. It is important that you know all of your rights and defenses you may have. As a Former Municipal Prosecutor and being recognized as one of the top 100 DWI Attorneys in New Jersey by the National Advocacy for DUI defense, I understand the importance of aggressive, quality representation. Having an experienced DWI attorney on your side is only to YOUR advantage. The Police have the Prosecutor on their side. You deserve to have someone fighting for you. Having the “right” attorney on your side will only increase your chances of beating the charge and/or minimizing the consequences which you are facing. Being arrested and charged with a crime or Disorderly Persons Offense in New Jersey can be a scary event in your life. The consequences could be severe and life altering. The results, could affect your freedom, your reputation and your ability to get a job or maintain employment. Choosing an aggressive criminal defense attorney to vigorously represent and defend you, is only to your benefit. It is important that you understand that you are innocent until proven guilty, and the State bears the burden of proving you guilty beyond a reasonable doubt, period. You deserve to know your rights, your defenses and your options. My job is simple, to fight for you! I have handled matters relating to: drug offenses, assaults, weapons charges, theft, shoplifting, hindering apprehension, gun charges, juvenile matters, burglary, robbery and other various types of criminal offenses. I have appeared in both the Superior Courts at the county level for indictable crimes, as well as, in the many Municipal Courts for Disorderly Persons Offenses. Are you eligible for an expungement or have your criminal record “cleared” in New Jersey? The vast majority of people that have “negative things” on their record realize that these “things” will not simply go away. As most employers are now conducting criminal background checks, it is very easy for someone to “dig up” your past. Having an expungement will lawfully allow you to answer “NO” if asked if you have been arrested or convicted of a crime. I can help you “erase” these negative events in your life and help give you the freedom that you are seeking. Did you or someone you know or love suffer an injury? Your life should not be affected due to someone else being at fault. My goal is simple. Since we cannot “turn back the hands of time” and put you in the same position as you were prior to the accident, the next best thing, is to fully compensate you for your injuries. I want to get you as much compensation as possible. Recently, I obtained a settlement in the amount of $3,250,000.00 on behalf of my client who sustained serious injuries due to someone else being careless. Whether you have been involved in a car accident, truck accident, slip and fall, motorcycle accident, been injured by a defective product or suffered any other personal injury, you deserve to be compensated for the injuries that someone else caused. You deserve to have an aggressive personal injury attorney on YOUR side. No fee unless you win! Family law matters, matrimonial cases and child custody disputes are some of the most personal, important and mentally challenging problems a person can go through. I have the compassion and understanding to not only help you through these tough times, but also the desire, knowledge and experience to fight for you and your children. My goal is to resolve these issues as quickly and painlessly as possible. If need be, I am also willing, ready and able to fight, in court, for your and your loves ones. I have successfully represented many people who have gone through divorce matters that were straight forward and those that were more complex and bitter. I have dealt with issues of child support, child custody, visitation, parenting time and other issues related to divorce type proceedings. Is your new vehicle a Lemon? If you purchased a new vehicle that is less than 3 years old, you may be entitled to get all of your money back or a new vehicle.If you prevail on a lemon law case or breach of warranty matter, all fees will be paid by the manufacturer. This is 100% cost free lemon law help. On all matters, I will personally handle your case myself from start to finish. I am here for you and offer FREE consultations. Feel free to contact me directly at (732) 321-9100 or online. We serve the following localities: Mercer County including Princeton and West Windsor; Middlesex County including East Brunswick, Edison, Highland Park, Metuchen, Milltown, Monmouth Junction, Monroe Township, North Brunswick, Old Bridge, Piscataway, Plainsboro, Sayreville and Woodbridge; and Monmouth County including Belmar, Englishtown, Freehold, Holmdel and Marlboro.